Text adapted from material written for #UpForJustice, a monthly email newsletter from the International Social Justice Commission (ISJC), archived at www.salvationarmy.org/isjc. It has been edited to fit a new format and added to by Joseph Halliday, an intern at the ISJC from 2016 to 2017, working with Lt‐Colonel Dean Pallant. Joseph also designed the publication. Images (other than author photos) taken from www.unsplash.com, licensed under Creative Commons. Scripture quotations are from the New International Version, unless otherwise stated. Copyright © 2017 The General of The Salvation Army. Entire extract from: Begbie, Harold, The History of The Salvation Army, Volume 2, 1920, London. Keller, Timothy, Every Good Endeavour, 2014, New York. Raise strategic voices to advocate with people particularly those who are poor and oppressed. Be a recognised centre of research and critical thinking on issues of global social justice. Collaborate with like‐minded organisations to advance the global cause of social justice. Exercise leadership in determining social justice policies and practices in The Salvation Army. Live the principles of justice and compassion and inspire others to do so. The UN provides various targets and indicators to give specific detail on the scope and aims of each Sustainable Development Goal. For each one of the double‐page spreads in Go and Do Something, we have provided a selection of these targets at the top of the page. The purpose of this is to create a variety of reflection and talking points for a general audience. No inference should be made about the importance or priority of the targets for each goal based on which ones we have reproduced; we have made our selection within the limits on the space available in this publication. We encourage you to find the full detail on the UN's Sustainable Development Knowledge Platform at sustainabledevelopment.un.org. Dr. Laurelle Smith Go and Do Something is for people of all ages who want to make the world a better place today, full of practical ideas for action, prayer points and facts. There are 17 topics – one for each of the SDGs. There are many ways to use this book: • Make time to read and reflect on one of the SDGs each day for the next 17 days and commit to 17 new ways you will change the way you act or think. • Discuss one of the chapters each week with other people. This could be in a Sunday School class, women’s meeting, during a music group practice, or in a Bible Study group. • Teachers can use this material in schools, particularly in a setting of group discussion or for project ideas. • Preachers can use this resource to inspire a sermon series on how people should live faithfully in the world today. The SDGs apply to every person, of every age, in every community and every country on Earth and were endorsed by all 193 member states of the United Nations in September 2015. Although every country starts from a different point for each goal, all nations have committed to work towards them. The SDGs are based on a shared vision of what world leaders want the world to be like in the future – a future that is secure, sustainable and based on equality of all peoples both between nations and within nations. The SDGs are based on a belief that no‐one should be left behind. It will not be enough that the average person has had their life improved. The poorest and most vulnerable people must also experience improvement in their lives with a reduction of the disparity between the richest and the poorest people. Why should we get involved with the SDG S? The fact that world leaders agreed on a set of goals reflecting values which The Salvation Army has promoted for 125 years is something to be welcomed – especially as it can result in positive change for the poorest and most vulnerable people. The goals identify issues and promote values very familiar to Salvationists: equality of all people with no discrimination; the well‐being of all people with all people able to flourish; being good stewards of the earth and its resources; seeking peace and security for all people. These are values that shine through the Bible and have inspired Christians for more than 2000 years. All people, without exception, are made in the image of God and are equally precious to him (Genesis 1:27‐31). In the Sermon on the Mount, Jesus declared: ‘Blessed are the peacemakers for they shall be called the children of God’ (Matthew 5:9). Jesus declared that he came that we might ‘have life and life in all its fullness’ (John 10:10). 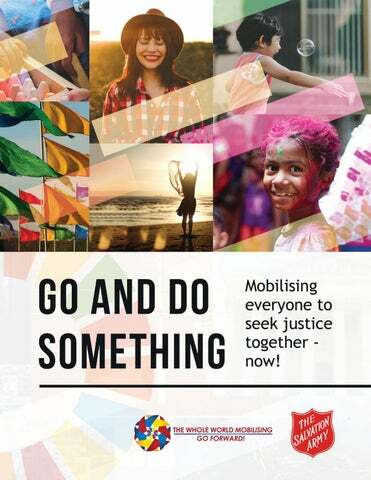 The SDGs recognise a lesson The Salvation Army learnt many years ago – people and communities need to participate in their own development. In addition, The Salvation Army recognises the importance of integration. Just as God created people as integrated persons with body and soul so those seeking to participate in God’s mission to save the world should not fragment services or treat only the body while trying to ignore the soul and spiritual healing. General André Cox is encouraging The Salvation Army to focus attention on the SDGs in every programme. This does not mean only in the developing world. The goals are universal, for every nation, for all people, everywhere. Can we pray for the SDG S? young girl was distraught and her sorrow uncontrollable; even though she knew it was an experiment, the pain was still unbearable. While viewers’ hearts melt with compassion, the temptation is to shake our heads at the insensitive people in the video. There is a nagging question: how many times do we walk by the poor without a second glance? Does the question ‘what can I do?’ ever surface as we step past those who are in need? The misguided thought that the poor belong on the street ‐ that they are used to or choose to be in poverty ‐ can easily lead us to justify our lack of action or response. Too often, it is the poor who crumble under the weight of injustice and are pushed into the periphery. Here are some statistics:2 • More than 1.2 billion people live in extreme poverty and live on less than $1.25 a day. • About 75% of the world's poor populations live in rural areas and depend on agriculture for livelihood. • In developing countries, the poor spend 60‐80% of their income on food. Americans, to use one example, spend less than 10%. Christians can play a significant role in addressing and fighting the issue of extreme poverty because of the God who lives in us! Time and again, the Bible speaks of a Christian’s social responsibility in light of the Gospel. Jesus did not just address humanity’s spiritual need but also the material, physical and emotional needs. He is the same God who became a man and in his humanity, identified with the poor by becoming poor himself. Jesus said, ‘The Spirit of the Lord is on me, because he has anointed me to proclaim good news to the poor. He has sent me to proclaim freedom for the prisoners and recovery of sight for the blind, to set the oppressed free, to proclaim the year of the Lord’s favour’ (Luke 4:18‐19). His heart was always tender and moved with compassion that led to action. As followers of Christ, the expectation for us is clear! Christians are called to take up the cause of the poor because it reflects the heart of the God we worship and serve. We are invited to become co‐labourers with Christ and become his eyes, ears, mouth, hands and feet in this world. WHAT Should WE PRAY FOR? • Patience and understanding between those experiencing poverty and those who are not. May we be better able to imagine ourselves living the lives of those around us and then use these experiences to inform our words and actions. • That governments will do more for those living in poverty ‐ poverties of food, finance and shelter. May they instigate and improve policies, encouraging accountability and addressing corruption. Pray that the world will see the poor as people and not as a problem or a project. • That those living in or close to poverty are able to gain the skills required to improve their situation. May people be willing to spend time and energy teaching these skills and may the necessary people ‐ for example, potential employers ‐ be able to see past current circumstances and offer relevant opportunities. WHAT Should WE PRAY FOR? • That a spirit of gratitude will be in those who have plentiful and nutritious food to eat; we thank God for a sufficient food supply in many areas of the world. • Vision, optimism and wisdom for those with the power and influence to make the distribution of food fairer. May we see an end to hunger. May those working to improve people's lives experience a sense of hope and a determination to continue. What can we do? • Make an effort to buy food that has been produced locally or through sustainable food systems. • Minimise food waste by making an effort not to throw out food and only buying what you need. • Look out for those around you: cook for people in your community who you know can not afford food; donate food to shelters and food banks; set up or volunteer at a community garden; start a feeding programme in your local school and community group. • If you are in a position to do so, sponsor a child or community in a developing country. healthY LIVES AND WELL-BEING Ensure healthy lives and promote well-being for all at all ages • Reduce the global maternal mortality ratio to less than 70 per 100,000 live births. • End preventable deaths of newborns and children under 5 years of age. • End the epidemics of AIDS, tuberculosis, malaria and neglected tropical diseases and combat hepatitis, water‐borne diseases and other communicable diseases. • Strengthen the prevention and treatment of substance abuse. • Achieve universal health coverage, access to quality essential health‐care services and access to safe, effective, quality and affordable essential medicines for all. obese. • 42 million children under the age of five were overweight or obese in 2013. The health and wellness of the entire person was central to the message and ministry of Jesus. It continued through the Early Church and is still central today. This message remains unchanged. God loves us and cares about our spirit, soul and body. He desires that we love others as we love ourselves. This includes caring for ourselves and our bodies – the temple of the Holy Spirit. As we journey through life, we can ask ourselves a number of questions to help move us to the right perspective. How does ignoring health and wellness, either spiritual or physical or mental, impact our ability to be a good witness to others; our ability to glorify, minister and serve God? One of the ways we can glorify God is by following a lifestyle and behaviour as far as possible that produces health and wellness rather than choosing to walk down a path leading to disease and sickness. Practically speaking, as we care for our bodies, we are more likely to remain active in serving God and others. Maybe we need a health plan! What does the Bible teach? • The Bible rates health as being very important. John, in his third letter, writes to Gaius: ‘Dear friend, I pray that you may enjoy good health and that all may go well with you, even as your soul is getting along well’ (3 John 2:2). As humans, our mind, spiritual nature and body are all interrelated and interdependent. What affects one affects the other. If our bodies are misused, our minds and spiritual natures cannot become what God ordained they should. • Paul, in his letter to the church in Rome, writes about placing our lives before God: ‘So here’s what I want you to do, God helping you: Take your everyday, ordinary life – your sleeping, eating, going‐to‐work, and walking‐ around life – and place it before God as an offering. Embracing what God does for you is the best thing you can do for him. Don’t become so well‐adjusted to your culture that you fit into it without even thinking. Instead, fix your attention on God. You’ll be changed from the inside out. Readily recognise what he wants from you, and quickly respond to it. Unlike the culture around you, always dragging you down to its level of immaturity, God brings the best out of you, develops well‐formed maturity in you’ (Romans 12:1‐2 The Message). • The Bible tells us that our bodies belong to God. Paul writes: ‘Do you not know that your bodies are temples of the Holy Spirit, who is in you, whom you have received from God? You are not your own; you were bought at a price. Therefore honor God with your bodies.’ (1 Corinthians 6:19‐20). WHAT Should WE PRAY FOR? • Those people who are suffering through poor health. May God bring physical healing, mental strength and the right support. May we be people who believe in the power of God to work through all cicumstances. • Compassion for the people around us. May we be aware of health issues both physical and mental. When we can provide assistance, may we do so, and may we always be concerned with the health and wellness of others. May hearts be softened so solutions can be generated and health and other resources can be shared. • That facilities and resources may be developed, particularly in places where they are currently lacking. May there be a willingness to implement the best care possible in all communities. with medicine and how to care for each other with love. Not everyone needs to be a doctor or a farmer, but when we are unable to give our fellow human beings access to the full opportunities of education we deprive them of the ability to participate fully in God’s design for human life. More than that, we rob our communities of the insight these people can give us. According to the United Nations: ‘[Education] contributes to fostering peace, democracy and economic growth as well as improving health and reducing poverty. Education beats poverty … promotes gender equality … reduces child mortality … contributes to improved maternal health … helps combat HIV, malaria and other preventable diseases … encourages environmental sustainability … [and] helps global development.’3 This is not to say that education is going to save the world. We cannot learn much about creation while ignoring the creator and some knowledge is too wonderful for us to attain. Education is not to replace a trust in God. Still, when we learn about and explore our world with God we find that it all points to him. What does the Bible teach? • God is the source of all knowledge. Proverbs 1:7 begins: ‘The fear of the Lord is the beginning of knowledge’. Proverbs 3:5 states: ‘Trust in the Lord with all your heart and lean not on your own understanding’. • John 8:31‐32 tells us of Jesus' words: ‘“If you hold to my teaching, you are really my disciples. Then you will know the truth, and the truth will set you free.”’ • The Lord, speaking to Moses in Exodus 31:2‐3 says: ‘“See, I have chosen Bezalel son of Uri, the son of Hur, of the tribe of Judah, and I have filled him with the Spirit of God, with wisdom, with understanding, with knowledge and with all kinds of skills”’. WHAT Should WE PRAY FOR? • All educators, headteachers/principals, administrators, school caretakers, cooks and coaches and others who help us to gain education. Ask that God would give them strength, wisdom and rest as they work to increase our understanding. • Those who do not have access to the education they need, whether that is basic primary education, vocational knowledge or academic work. May they get access to the opportunities they need in order to progress and to lead fulfilling lives. • World leaders who decide and influence education policy, and for those working to improve access to education. May they have understanding of the benefits learning brings. • That God would reveal areas in your life where you may seek greater understanding of his creation. Pray that he would give you wisdom. grandmother left school when she was only 14 years old – and before then she had hardly attended school. She was the eldest daughter and so even at a very young age it was her role to look after all the other children. Her education had a low priority in the family. I have always been thankful for the opportunities I have been given, not only in education but in many other spheres of life. However, I recognise that I am one of the privileged. Many women in the world are treated very differently, not just denied opportunities but used and abused by men, and other women, because they are seen as ‘lesser’ beings, and therefore not entitled to care or protection. Statistics for violence against women, both physical and sexual, not to mention mental and psychological are horrifying. These statistics will only change if perceptions of women are changed. Only when perceptions change will gender equality become a reality. What does the Bible teach? • At the beginning of the Bible we are told the story of creation and the place of people in the creation. ‘So God created mankind in his own image, in the image of God he created them; male and female he created them. God blessed them and said to them, “Be fruitful and increase in number; fill the earth and subdue it. Rule over the fish in the sea and the birds in the sky and over every living creature that moves on the ground”’ (Genesis 1:27‐28). • The gospels show us how Jesus treated women. Christ came into the world so that people could have life, and life in all its fullness, not dependent on gender, race, colour or power. ‘As Jesus and his disciples were on their way, he came to a village where a woman named Martha opened her home to him. She had a sister called Mary, who sat at the Lord’s feet listening to what he said. But Martha was distracted by all the preparations that had to be made. She came to him and asked, “Lord, don’t you care that my sister has left me to do the work by myself? Tell her to help me!” “Martha, Martha,” the Lord answered, “you are worried and upset about many things, but few things are needed – or indeed only one. Mary has chosen what is better, and it will not be taken away from her”’ (Luke 10:38‐42). The place of women is often seen as being in the home and attending to all the chores involved, including cooking and looking after everyone in the home. Here Jesus very clearly demonstrates that women should be given the same opportunities as the men to learn. He did not join Martha in reprimanding Mary for not being in the kitchen, instead he praised Mary for choosing the better option, to join with the men to listen to his teaching. WHAT Should WE PRAY FOR? • Women and girls who are suffering, being treated as less than their true worth because of their gender. • Attitudes to change, making it unacceptable to commodify women or men so that all people are recognised as being persons of value. • Pray that all men and women, girls and boys in the Church will learn to respect one another, to appreciate their difference and recognise how together we can enhance one another, witnessing the world to the beauty of gender. clean water and sanitation Ensure availability and sustainable management of water and sanitation for all • Achieve universal and equitable access to safe and affordable drinking water for all. • Achieve access to adequate and equitable sanitation and hygiene for all and end open defecation, paying special attention to the needs of women and girls and those in vulnerable situations. • Improve water quality by reducing pollution, eliminating dumping and minimizing release of hazardous chemicals and materials, halving the proportion of untreated wastewater and substantially increasing recycling and safe reuse globally. • Substantially increase water‐use efficiency and ensure sustainable withdrawals and supply of freshwater to address water scarcity. • Protect and restore water‐related ecosystems, including mountains, forests, wetlands, rivers, aquifers and lakes. opportunities for paid work. Travelling also puts those who live in areas of conflict at danger. The question remains: how can water access and technology reach those in need? SDG 6 provides targets and initiatives for the world to follow. The UN's World Toilet Day works to educate the public on the lack of accessible water and sanitation throughout the world. This is a day for action and advocacy, and seeks to educate the public about the 2.4 billion people – particularly women and children – who do not have improved sanitation. It is important to note the significant work of The Salvation Army in water and sanitation programmes in countries including Angola, Papua New Guinea, Sri Lanka and Zambia. These, along with other programmes around the globe, serve as a model for further work and improvement for access to clean water and sanitation. What does the Bible teach? • In John 4:13‐14, Jesus says: ‘“Everyone who drinks this water will be thirsty again, but whoever drinks the water I give them will never thirst. Indeed, the water I give them will become in them a spring of water welling up to eternal life.”’ Humans need water that is clean and pure: it cleanses; refreshes; is life‐giving; is essential. Salvation with Jesus is the same. It gives eternal life. • In John 4:10‐15 we read: ‘Jesus answered her, “If you knew the gift of God and who it is that asks you for a drink, you would have asked him and he would have given you living water.” “Sir,” the woman said, “you have nothing to draw with and the well is deep. Where can you get this living water? Are you greater than our father Jacob, who gave us the well and drank from it himself, as did also his sons and his livestock?” Jesus answered, “Everyone who drinks this water will be thirsty again, but whoever drinks the water I give them will never thirst. Indeed, the water I give them will become in them a spring of water welling up to eternal life.” The woman said to him, “Sir, give me this water so that I won’t get thirsty and have to keep coming here to draw water.”’ • Isaiah 12:3 says: ‘With joy you will draw water from the wells of salvation.’ The very use of this metaphor reminds us that water is deemed an essential part of life. Efforts should be made to provide it universally. May those who do not know the ‘joy’ of clean water come to have access to it. WHAT Should WE PRAY FOR? • Give thanks for the life‐giving water that Jesus freely gives. • The ongoing work of water and sanitation programmes – bringing growth, stability and further projects while ensuring safety, health, growth, development and salvation. Also for the finances of ongoing these projects in areas of need, drought, conflict and natural disaster relief. • Those without access to clean water and sanitation around the world – that they may be replenished both spiritually and physically. May the Lord shine upon them. What can we do? • Support The Salvation Army's Watershed project (www.salvationarmy.org.uk/watershed). Raise money ‐ perhaps by taking the Tap Water Challenge ‐ and find out more about the impact of this work across the world. You will find many resources on the website of The Salvation Army's International Development Service. • Challenge world leaders to improve sanitation in areas where it is needed. Whether it be fresh water supply or better sewage works, urge governments and world leaders to make this issue a higher priority. Ensure universal access to affordable, reliable and modern energy services. Increase substantially the share of renewable energy in the global energy mix. Double the global rate of improvement in energy efficiency. Enhance international cooperation to facilitate access to clean energy research and technology, including renewable energy, energy efficiency and advanced and cleaner fossil‐fuel technology, and promote investment in energy infrastructure and clean energy technology. acquire basic technology that western societies take for granted. However, generating enough power to meet these reasonable demands is a major challenge. Many countries have committed to reduce their reliance on fossil fuels (oil, coal, natural gas) due to environmental concerns. However, these fuels accounted for 87 per cent of global primary energy consumption in 2012. It is predicted by 2040 liquid fuels, natural gas, and coal will still account for more than 75 per cent of total world energy consumption.1 Replacing fossil fuels with nuclear energy raises many safety concerns. We can hope that scientists will discover ways to harness energy from the sun, wind and water – so called ‘green energy’ sources – but in reality it is likely to be a long time before cheap, sustainable energy sources can meet the world’s demand for power. This is a complex problem. There are no simple solutions, but that does not mean we can avoid the problem, close our eyes and hope it goes away. What does the Bible teach? Most of the energy sources we use today had not been discovered in Bible times. There are no Scripture verses instructing us on whether we should build or close nuclear power stations, for example. However, the Bible does contain some principles which help us decide what to do. The International Positional Statement on Caring for the Environment (www.salvationarmy.org/isjc/ips) highlights three important principles: • God is the creator, governor and preserver of all things. The Earth belongs to the Lord and everything in it (Psalm 24:1, Exodus 19:5). As people made in the image of God (Genesis 1:27) we have been entrusted with the care of the Earth’s resources (Genesis 2:15). God invites us to share responsibility for the care of Creation (Genesis 1:28‐31; 2:15) and participate in the work of healing the world (Romans 8:19‐22). • The relationship of God to Creation is one of loving care and concern. Humanity’s stewardship of the earth is a reflection of that care, as human beings are made in the image of God. The world was made to praise God and reveal his glory (Psalm 19:1‐6); our stewardship of it furthers that end. • The degradation of the earth is, in part, the result of human activity (Isaiah 24:5‐6) and it is therefore our responsibility to work for its healing. The biblical command to humanity to ‘subdue’ and ‘rule’ should be interpreted as a requirement to be good stewards rather than understood as justifying abuse of the Earth’s resources (Genesis 1:28). The disproportionate effect that climate change and environmental degradation has on the poorest parts of the world creates additional responsibilities to defend the cause of those who are vulnerable by restoring a sense of justice to the global community (Micah 6:8). WHAT Should WE PRAY FOR? • For people in the world who have access to energy – may we always be good stewards of the resources entrusted to us. May we never be wasteful or arrogant by consuming more than needed. • For those who are working to develop sustainable sources of energy – may they have insight and wisdom to develop solutions which benefit the poorest members of society. • For those who cannot access enough power for their basic needs. Good work and economies Promote sustained, inclusive and sustainable economic growth, full and productive employment and decent work for all • Sustain economic growth in accordance with national circumstances. Achieve higher levels of economic productivity through diversification, technological upgrading and innovation. • Achieve full and productive employment and decent work for all women and men, including for young people and persons with disabilities, and equal pay for work of equal value. • Eradicate forced labour, end modern slavery and human trafficking and end child labour. • Protect labour rights and promote safe and secure working environments for all workers, including migrant workers and those in precarious employment. population still lives on the equivalent of approximately US$2 a day. And in too many places, having a job does not guarantee the ability to escape from poverty.2 SDG 8 is a well‐rounded goal that addresses many components, such as: • Efforts towards quality job creation; • Sustainable economic productivity and technological innovations; • Lessening environmental impact; • Encouraging fair practices in banking and investing; • Creation of more small and medium enterprises; • Instilling policies that eradicate forced labour, human trafficking, illegal trade and other criminal activities; • Responsible money practices. There are many issues crammed into this one SDG, but such an all‐encompassing goal is required to tackle the power of greed in our world today. WHAT Should WE PRAY FOR? • Give thanks for the innovations that allow our economies to develop and often for jobs to improve. We have made breakthroughs in industry through skills and talents that God has given. • For an end to all forms of abuse in the workplace: exploitation, forced labour and unfair practices. May God work in the lives of the people who carry out the abuse. May those who have been abused find a way out ‐ towards peace and decent work. • For improvements in conditions and the quality of life of all people, to ensure that nobody is left behind. Build resilient infrastructure, promote inclusive and sustainable industrialization and foster innovation • Develop quality, reliable, sustainable and resilient infrastructure to support economic development and human well‐being, with a focus on affordable and equitable access for all. • Promote inclusive and sustainable industrialization and significantly raise industry’s share of employment and gross domestic product. • Increase the access of small‐scale industrial and other enterprises to financial services, including affordable credit, and their integration into value chains and markets. school, William found books on science. The illustration of a windmill intrigued him. The words said that windmills could create electricity and pump water. With fortitude and ingenuity, William scrounged materials from the junkyard – a discarded tractor fan, old bicycle frame, shock absorber, melted plastic piping and a used dynamo. Eventually, his family extended their days with four small lights powered by the windmill‐ generator his labours had created. Then he built a second windmill that pulled water from a small well near his home to irrigate his family’s farm. As a result, they began growing two crops of maize a year.1 The material conditions of human life impact the spiritual conditions; and the spiritual health of a people impacts its infrastructure. The interplay is not simple or always the same, but it is real. God has made people to be embodied souls and ensouled bodies. As we pray about SDG 9, and about resilient infrastructure, industrialisation and innovation, we need to pray that the economic and political leaders of the world will realise the connection. Learn more at his TED talk (https://www.ted.com/talks/william_kamkwamba_how_i_harnessed_the_wind) and the ISJC resource 'Think on These Things' (https://issuu.com/isjc/docs/think_on_these_things). What does the Bible teach? • The Bible doesn’t talk about the internet or wind‐generated electricity, but it actually speaks about the concept of infrastructure. One of the things that makes the picture we are given of the New Jerusalem a delight is that it is solidly built, well‐watered and superbly lit; roads from north, south, east and west point towards it, and people from everywhere can travel them without fear. There is no better portrayal of ‘resilient infrastructure’ than this. • The Bible also shows us infrastructure being used for unjust purposes. Ephesians 2 describes how Christ came to tear down and destroy the walls of hostility that had been erected for the purpose of keeping people apart. This reminds us that resilient infrastructures – such as iron curtains, bamboo curtains and razor‐wired borders – are not necessarily good or just or in keeping with God’s vision. • When the apostle Paul described Jesus Christ as the ‘cornerstone’, he used material infrastructure as an analogy for spiritual infrastructure. But when the Book of Nehemiah describes the rebuilding of Jerusalem, it uses the language of infrastructure straightforwardly. It’s an informative story of repairing walls and buildings and securing points of border‐crossing after Jerusalem’s fall to the Babylonians. One thing that makes it informative is the various ways in which it reminds us that being a ‘Restorer of Streets’ (Isaiah 58:12) matters materially and spiritually. The two are connected. WHAT Should WE PRAY FOR? • Give thanks to God, the Creator, Preserver and Governor of all things. ‘For every house is built by someone, but God is the builder of everything’ (Hebrews 3:4). • For all those who are engaged in the work of rebuilding what has been destroyed by war and animosity, thereby making it harder for people to experience the good things of life. • For the persistent resolve of national leaders who have pledged to pursue SDG 9.
the poorest countries – is asked to participate in this annual project to raise funds. That money enables people with few financial resources to help themselves. Corruption and greed are usually the root cause of why there is inequality within and among countries. The human desire to look after oneself, rather than care about others, is caused by our sinful nature. Scripture addresses inequality, and in 1 John 2:16 we read: ‘For everything in the world—the lust of the flesh, the lust of the eyes, and the pride of life—comes not from the Father but from the world.’ As long as there is sin in this world, reducing inequities within and among countries will be a problem. But the words of Jesus remind us of a reality: ‘I have told you these things, so that in me you may have peace. In this world you will have trouble. But take heart! I have overcome the world’ (John 16:33). WHAT Should WE PRAY FOR? • People who suffer as a result of inequality. Whether through limited opportunity, isolating conversations and attitudes or an unfulfilled quality of life, may they experience a sense of hope and purpose. • Fellow Christians who experience inequality, injustice and poverty in their daily lives. May their faith in Christ remain strong despite their challenges. May those who do not currently know God discover their value in him. • People across society and around the world who act unfairly as a result of prejudice and societal attitudes. May circumstances change and all people work together to achieve the best situations for each other. What can we do? • Be an advocate for those who are disadvantaged because of inequalities. For instance, create or engage with conversations about pay gaps, challenge attitudes that promote inequalities and be intentional about having a positive approach to those who are different from you. • Support initiatives designed to reduce inequalities and deliver practical support to the disadvantaged. For example, look into projects that support the homeless, the poor, minorities and other groups. Sustainable communities Make cities and human settlements inclusive, safe, resilient and sustainable • Ensure access for all to adequate, safe and affordable housing and basic services; upgrade slums. • Provide access to safe, affordable, accessible and sustainable transport systems for all, improving road safety, notably by expanding public transport. • Provide universal access to safe, inclusive and accessible, green and public spaces. • Support least developed countries in building sustainable and resilient buildings. residents of favelas have to teach us? In recent years, a number of favelas have been building communities of resilience by working hand in hand with the land and with each other. They govern themselves creatively and sustainably. Informal waste collection systems are organised. Bicycles are commonly used for transit. Houses are constructed on stronger foundations, providing protection from natural disaster. Vegetable gardens are grown for nutritional benefits. Forests and wildlife are seen as natural resources to be protected. People support one another when there is need. A number of residents claim that they live in a favela not because they have to but because they choose to.3 One non‐ governmental service worker observes: ‘Everyone knows everyone. There aren’t walls around the houses, everything is open.’ Sounds a little bit like the city of God, doesn’t it? However, it will be challenging for favelas to develop some other components of SDG 11 if they continue to be neglected by their municipal governments. Let’s continue to live in hope that increasing support will be given to disenfranchised communities and that welfare and justice will be achieved for everyone. What does the Bible teach? • God is in the midst of cities and communities because he cares about them. Genesis 28:16‐17 we read: ‘When Jacob awoke from his sleep, he thought, “Surely the Lord is in this place, and I was not aware of it.” He was afraid and said, “How awesome is this place! This is none other than the house of God; this is the gate of heaven.”’ See also Psalm 46. • We are encouraged to pray for the most vulnerable, and work for and with them ‐ see Exodus 22:21‐24 and Psalm 68:5. • Along the way, we can be inspired by the vision of a transformed city – the new Jerusalem! ‐ see Hebrews 13:14, Galatians 4:26 and Revelation 21‐22. WHAT Should WE PRAY FOR? • In thankfulness to God for the gift of healthy human communities and the relationships we enjoy within our cities (Hebrews 10:24‐25; Psalm 133:1; Isaiah 45:18). • Pray for Salvation Army ministry in areas of urban poverty. The Salvation Army was born in the urban slums of Victorian England and still there are many Salvationists around the world seeking to make cities inclusive, safe, resilient and sustainable. May God’s will be done in our own cities today just as it is in Heaven (Matthew 6:10). • Pray for those who are part of Salvation Army ministries across the world, that they will not grow weary of doing good (Galatians 6:9). • For government authorities in developing countries. Pray that they will be moved by the cries of those living in poor conditions and that they will respond in just and compassionate ways (Matthew 14:14). • Pray for governments around the world that have signed up to the SDGs, that they will continue to show commitment to the just transformation of cities and city life (1 Timothy 2:1‐2). responsible consumption Ensure sustainable consumption and production patterns • Achieve the sustainable management and efficient use of natural resources. • Halve per capita global food waste at the retail and consumer levels and reduce food losses along production and supply chains, including post‐harvest losses. • Achieve the environmentally sound management of chemicals and all wastes throughout their life cycle and significantly reduce their release to air, water and soil in order to minimize their adverse impacts on human health and the environment. • Substantially reduce waste generation through prevention, reduction, recycling and reuse. • Encourage companies, especially large and transnational companies, to adopt sustainable practices and to integrate sustainability information into their reporting cycle. • Promote public procurement practices that are sustainable, in accordance with national policies and priorities. God’s creation and each other. Three statistics that highlight this global problem are:1 • Each year, an estimated one third of all food produced – equivalent to 1.3 billion tons worth around $1 trillion – ends up rotting in the bins of consumers and retailers, or spoiling due to poor transportation and harvesting practices. • Humanity is polluting water faster than nature can recycle and purify water in rivers and lakes. • Households consume 29 per cent of global energy and consequently contribute to 21 per cent of resultant CO2 emissions. In the Bible we learn that from the beginning God has created the world and it is our responsibility to care for what God has created. Responsible consumption and production play a significant role in this process. As Salvationists, we should not only give a hand to others but to our world as well. WHAT Should WE PRAY FOR? • The countries of the developing world that deal with famine, drought and lack of electricity. • The work of those across the world who are advocating for the care of our environment. • Leaders of industry, government and organisations who have influence on production and consumption. May they be aware of their impact and so act responsibly, constantly leading the way for a better planet. • An attitude amongst people that is considerate of the environment. May we see lifestyle changes to keep our environment healthy and clean. climate change Take urgent action to combat climate change and its impacts • Strengthen resilience and adaptive capacity to climate‐related hazards and natural disasters in all countries. • Integrate climate change measures into national policies, strategies and planning . • Improve education, awareness‐raising and human and institutional capacity on climate change mitigation, adaptation, impact reduction and early warning. • Promote mechanisms for raising capacity for effective climate change‐related planning and management in least developed countries and small island developing States. climate change and its impact. It affects not only humans but animals too. Acidification has increased causing sea life to die and thereby decreasing the food supply for humans. Snow caps, glaciers and ice sheets continue to shrink, decreasing our fresh water source. Climate change also affects our health. Research states that with the increase of climate change, it has brought on the effects of pollen earlier, causing severe allergies in people, increasing health and medical insurance costs and leaving people even more vulnerable and financially distressed. It is important to tackle this problem, to educate people and make it our responsibility to help stop climate change from overcoming us and destroying our world. As God's children, it is our responsibility to watch over the land, sea and animals, to take care of his creation and to help sustain it. As Salvationists, we need to take this responsibility seriously. When we declare that we love God and others, we need to show this through our actions. Showing our love to God includes being responsible for the earth that he created. What does the Bible teach? • Psalm 104 says: ‘Lord my God, you are very great; you are clothed with splendor and majesty’. The Scripture describes God’s handiwork, His love for His creation and His watchful eye over it all. He feeds the animals and His people, He replenishes the mountains with water, and provides the land with nutrients. God created all living creatures, and He created the Earth. • According to Genesis 1 and 2, God extended this caretaking to humans. ‘Be fruitful and increase in number; fill the earth and subdue it. ... The Lord God took the man and put him in the Garden of Eden to work it and take care of it.’ It is our responsibility to help watch over it, take care of it, and to love it as God does. • Read Isaiah 65:17‐25. See how this new world will be God's work and that ‘the sound of weeping and of crying will be heard in it no more’ ‐ it will not be destroyed. WHAT Should WE PRAY FOR? • Those around the world who are suffering and facing hardship due to environmental changes. May they experience a sense of hope, and be able to see real improvement. • A sense of responsibility in the hearts of people to care for this planet. From individuals to companies to governments, may we all exercise our influence to do good, making small and profound changes. Governments to be responsible and to make a stronger commitment for a cleaner environment. May the impact of our actions and policies be kept in mind and be a key consideration in this process. • Christians to understand that we are stewards of God’s creation and to be an example for others. May we comprehend God's vision for our role in taking care of the planet and act upon it. SUSTAINING oceans Conserve and sustainably use the oceans, seas and marine resources • Prevent and significantly reduce marine pollution of all kinds, in particular from land‐ based activities, including marine debris and nutrient pollution. • Sustainably manage and protect marine and coastal ecosystems to avoid significant adverse impacts and take action for their restoration in order to achieve healthy, productive oceans. • Effectively regulate harvesting and end overfishing, illegal, unreported and unregulated fishing and destructive fishing practices and implement science‐based management plans. • Enhance the conservation and sustainable use of oceans and their resources. around the world will be displaced due to the effects of climate change on our great oceans. According to the US Committee on Biological Diversity in Marine Systems, the most serious threats to marine biodiversity are: fishing operations; chemical pollution and eutrophication; alteration of physical habitat invasions of exotic species; and global climate change. In New Zealand in particular many of our activities impact on our marine biodiversity, including: • fishing ‐ recreational and commercial land use ‐ through sediments and pollution • exotic pests ‐ introduced by shipping in ballast water and fouled hulls • human‐induced climate change ‐ affects ocean temperature and levels We should be concerned in how the ocean is looked after. The sea is part of our lives both for recreation and a source of food and income. Let us each bring joy back to the fishes in the deep blue sea and enjoy the majesty and beauty of the seas around us that God has entrusted to our care. WHAT Should WE PRAY FOR? • For the amazing diversity of the world God created. From dry, vast expanses of desert to beautiful rainforests and rivers and all that comes in between, we have so much to be awe‐struck by. • For mindfulness of our impact on the oceans and wildlife at all times. May we strive to choose the better, more sustainable option even if it requires more effort or expense. • Give those with responsibility – leaders, businesses, communities – the foresight to care for the environment with actions and plans that look far into the future. May they look past the short‐term, crowd‐pleasing measures and do what is best for the planet. Protect, restore and promote sustainable use of terrestrial ecosystems, sustainably manage forests, combat desertification, and halt and reverse land degradation and biodiversity loss • Ensure the conservation, restoration and sustainable use of terrestrial and inland freshwater ecosystems and their services, in particular forests, wetlands, mountains and drylands. • Promote sustainable management of all types of forests, halt deforestation, restore degraded forests and substantially increase afforestation and reforestation globally. • Combat desertification, restore degraded land and soil, including land affected by desertification, drought and floods, and strive to achieve a land degradation‐neutral world. • Take urgent and significant action to reduce the degradation of natural habitats. and our forests need us. My wife and I travel around the Kenya East Territory preaching at Salvation Army corps and leading community meetings. We always urge people to plant trees during rainy seasons and protect the existing ones. In Kenya a government agency, the National Environmental Management Authority (NEMA), is trying to improve the situation. The government have put in a mechanism whereby if you want to cut down any tree – even from your own compound – you need a permit to do so.3 However, we should not care for the forests, ecosystems and soil just because the UN or governments think this is important. We do it because the Bible tells us it is important. I commit myself to always urge communities to protect our forests to avoid desertification and reverse land degradation by working with Salvation Army leaders, divisions, corps and centres in Kenya East Territory. How can you help? What does the Bible teach? The Salvation Army's International Positional Statement entitled 'Caring for the Environment' explains what God wants us to do in regards to this issue and why it is important (www.salvationarmy.org/isjc/ips): • ‘God is the creator, governor and preserver of all things. The Earth belongs to the Lord and everything in it (Psalm 24:1, Exodus 19:5). As people made in the image of God (Genesis 1:27) we have been entrusted with the care of the Earth’s resources (Genesis 2:15). God invites us to share responsibility for the care of Creation (Genesis 1:28‐31; 2:15) and participate in the work of healing the world (Romans 8:19‐22). • The relationship of God to creation is one of loving care and concern. Humanity’s stewardship of the earth is a reflection of that care, as human beings are made in the image of God. The world was made to praise God and reveal his glory (Psalm 19:1‐6); our stewardship of it furthers that end. • The degradation of the earth is, in part, the result of human activity (Isaiah 24:5‐6) and it is therefore our responsibility to work for its healing. The biblical command to humanity to ‘subdue’ and ‘rule’ should be interpreted as a requirement to be good stewards rather than understood as justifying abuse of the Earth’s resources (Genesis 1:28). The disproportionate effect that climate change and environmental degradation has on the poorest parts of the world creates additional responsibilities to defend the cause of those who are vulnerable by restoring a sense of justice to the global community (Micah 6:8). WHAT Should WE PRAY FOR? • Give thanks to God for all of nature ‐ ecosystems that sustain life and beautify the planet. • For those who are developing policies and programmes to protect God’s creation. May they act with justice; prioritising the needs of poor and marginalised people and acting against those who seek to exploit the world’s resources for selfish purposes. • That people will become more aware of the problems of deforestation, and that legislation and projects will cause them to think again about the impacts of their actions. some $1.26 trillion per year for developing countries. This amount of money could be used to help those living on less than $1.25 per day for at least six years.’1 A stable and fair government allows a country to develop, offers its residents safety and improves access for all to health services, education, and justice. Every act of corruption, each fraud and each extortion of money undermines the whole of humanity. These issues affect every part of the world ‐ including The Salvation Army. General André Cox is encouraging greater accountability across our organisation: 'In a world of shifting values, we need to be people of spiritual vitality and integrity, faithful and dynamic in mission.' Visit the website of the Accountability Movement at www.salvationarmy.org/account ability for further information. What does the Bible teach? • Reading the Old Testament, we see that injustice and violence have always existed. ‘There are those who turn justice into bitterness and cast righteousness into the ground’ we read in Amos 5:7. ‘There are those who oppress the innocent and take bribes and deprive the poor of justice in the courts’ (Amos 5:12). • Zechariah calls on us to act, by contrast, with wisdom and integrity: ‘This is what the Lord Almighty said: “Administer true justice; show mercy and compassion to one another. Do not oppress the widow or the fatherless, the foreigner or the poor. Do not plot evil against each other… These are the things you are to do: Speak the truth to each other, and render true and sound judgment in your courts”’ (Zechariah 7:9‐10; 8:16). • Isaiah reminds us that God expects us to defend the most vulnerable – to ‘loose the chains of injustice and untie the cords of the yoke, to set the oppressed free and break every yoke’. His challenge continues: ‘ … share your food with the hungry and … provide the poor wanderer with shelter – when you see the naked, … clothe them, and [do not] turn away from your own flesh and blood’ (Isaiah 58:6‐7). WHAT Should WE PRAY FOR? • Our authorities, nationally and internationally; for all forms of institutions, governmental, private, religious and financial – that God guides them and reprimands them if necessary so that they are honest, that the law is applied and that justice is done. • Those who abuse, those that manipulate the weakest, those who enrich themselves through corruption, bribery and tax evasion. May God open their eyes to the consequences of their actions and create in them a spirit of repentance. • Those who suffer injustice and violence: the weak, children, women, the marginalised, refugees and rejected populations – that God extends his healing and protective hand on them. • Pray for the countries that, because of their history, have a culture of dependency and submission. May these countries recover, be strengthened and take responsibility for their future. WHAT Should WE PRAY FOR? • The success of individuals, NGOs and other organisations as they work towards the fulfillment of the Sustainable Development Goals. May partnerships between these parties be strong and successful. 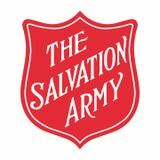 • The Salvation Army as it seeks to develop good partnerships with other agencies and groups around the world. May we be willing to work with others to achieve God’s purposes on earth. May we also be willing to say no to partnerships if they divert or distract us from participating in God’s mission on Earth. • A sense of understanding on the part of all those who seek justice ‐ that we may be willing to listen to those around us and to grow, and where we disagree to do so respectfully. What can we do? • Make an effort to understand somebody that you do not naturally get on with. Perhaps you disagree with them about an issue ‐ but you can still respect their viewpoint and try to find some common ground. Read Luke 6:27‐28. Jesus wants us to be willing to get along with others around us and value the contribution that others make to our lives and community. If this is not something that comes easily to you, perhaps you can set it as a personal goal. • Work in partnership with others. It may seem that SDG 17 will play out internationally between high‐level organisations, politicans and companies, but we all have a role to play. New intiatives will get off the ground through individuals partnering with friends, family and colleagues, as well as others in their church. Look around you for people with the skills to develop and advance your efforts in fund‐raising, volunteering and other ways.